It is generally believed that athletes experience pain in a different way than normally active individuals. Many scientists have confirmed the hypothesis that long-term physical activity can alter the perception of pain, i.e. athletes have a higher pain sensation and pain tolerance thresholds. The measurement of pain intensity is carried out using subjective methods based on verbal and non-verbal information, describing the clinical characteristics of pain. These psychological methods include the use of scales and questionnaires. Objective methods (thermal, mechanical and electrical) are used only to determine the pain sensation and pain tolerance thresholds. The specificity and prevalence of chronic pain syndromes have resulted in the increased number of studies on healthy and physically active individuals. It seems that determination of the effects of exercise on the perception of pain might help in the understanding of mechanisms of pain generation. 1. Bonica J.J. The Managment of Pain. Philadelphia 1990; wyd. II; Lea-Febiger. 2. de Good D., Kiernan B. Perception of fault in patients with chronic pain. Pain 1996; 64:153-15. 3. Dobrogowski J., Kuś M., Sedlak K., Wordliczek J. Ból i jego leczenie. Springer PWN, Warszawa 1996. 4. Domżał T. Ból podstawowy objaw w medycynie. Wydawnictwo lekarskie PZWL, Warszawa 1996. 5. Egan S. Acute-pain tolerance among athletes. Can. J. Sport Sci 1987;12:175–8. 6. Fruhstorfer H., Lndblom U., Schmidt W.G. Method for quantitative estimation of thermal thresholds in patients. Journal of Neurology, Neurosurgery, and Psychiatry, 1976; 39, 1071-1075. 7. 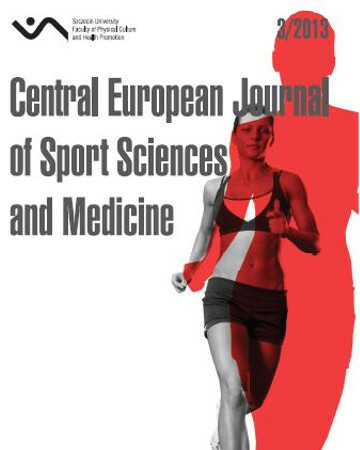 Guieu R., Blin O., Pouget J., Serratrice G. Nociceptive threshold and physical activity. Can. J. Neurol. Sci. 1992; 19:69–71. 8. Janal M.N., Glusman M., Kuhl J.P., Clark W.C. Are runners stoical? An examination of pain sensitivity in habitual runners and normally active controls. Pain 1994; 58:109-16. 9. Melzack R. The McGill Pain Questionnaire: major properties and scoring methods. Pain 1975; 1:277-99. 10. Ord P., Gijsbers K. Pain thresholds and tolerances of competitive rowers and their use of spontaneous self-generated pain-coping strategies. Percept. Mot. Skills 2003; 97:1219–22. 11. Paparizos A.L., Tripp D.A., Sullivan M.J.L., Rubenstein M.L. Catastrophizing and pain perception in recreational ballet dancers. J. Sport Behav. 2005;28:35–50. 12. Pyszkowska J. Ocena bólu przewlekłego w kategoriach ilościowych i jakościowych. Rozprawa na stopień doktora nauk medycznych. Akademia Medyczna Gdańsk 1998. 13. Scott V., Gijsbers K. Pain perception in competitive swimmers. Br. M. Journal 1981; 283: 91-93. 14. Sedlak K. Polska wersja McGill Pain Questionnaire 1997 (unpublished data). 15. Smith L.D. The effects of competition and exercise on pain perception. Dissertation 2004. 16. Sternberg W.F., Bailin D., Grant M., Gracely R.H. Competition alters the perception of noxious stimuli in male and female athletes. Pain 1998; 76:231–8. 17. Szatanik K. Kwestionariusz bólowy - założenia, budowa kwestionariusza, wyniki przeprowadzonych badań. V Konferencja Sekcji Badania I Leczenia Bólu. Poznań-Błażejewko 1985. 18. Szczudlik A. Propozycja konstrukcji polskiego „języka bólu”. Neur. Nerochir. Pol. 1983; 5:547-552. 19. Tajet-Foxell B., Rose F.D. Pain and pain tolerance in professional ballet dancers. Br. J. Sports Med. 1995; 29:31–4. 20. Tesarz J., Schuster A.K., Hartmann M., Gerhardt A., Eich W. Pain perception in athletes compared to normally active controls: A systematic review with meta-analysis. Pain 2012; 153:1253-1262.